Seldom available, a charming and well presented home, set within generous and secluded garden grounds, located in the heart of Thorntonhall. Cherry Cottage provides flexible accommodation with many of the principal apartments oriented to enjoy the views over the private garden grounds and surrounding countryside. Ground Floor: Entrance vestibule. Spacious reception hallway with staircase to upper level. An impressive and generously proportioned sitting room with a feature fireplace and commands lovely views over the garden and surrounding countryside. Garden room with access to the terrace and gardens. Formal dining room with fireplace, affording views to the gardens. Well appointed contemporary kitchen. Conservatory overlooking front garden. The spacious master bedroom has lovely views over the grounds and benefits from ample wardrobe space. Bedroom four/family room. Attractively refitted house shower room. Upper Floor: Upper landing with study area. Bedroom two and bedroom three are both of double proportions. Modern bathroom services both upstairs bedrooms. A particular feature of this property in Cherry Cottage is the outstanding gardens. 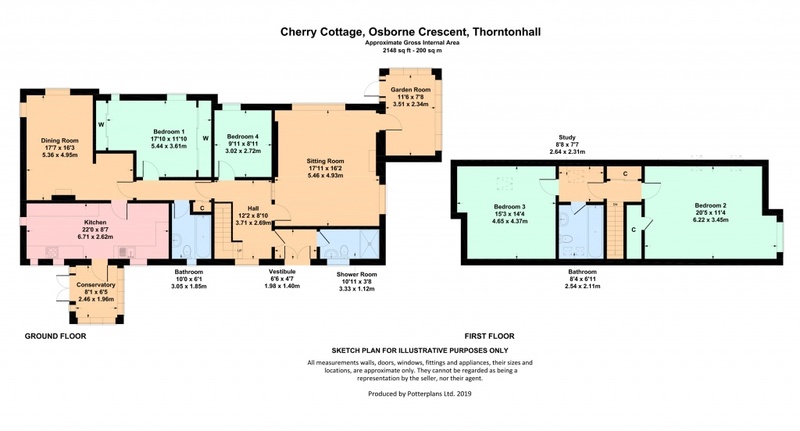 The house itself is set back from Osbourne Crescent and there is a driveway offering ample space for a number of cars, leading to a detached double garage. The established grounds are enclosed and provide privacy and seclusion. To the rear of the property there is a well-tended garden with an extensive area of lawn and large terrace. Additional large parkland section of gardens to the rear of the property, may offer further development, subject to the relevant consents. The property is further complemented by gas central heating, double glazing and is protected by a security alarm system. A regular train service runs from Thorntonhall to Glasgow Central Station and excellent shopping facilities can be found in East Kilbride (3 miles) and Newton Mearns (4 miles). There are a number of golf courses in the area and also a selection of local health clubs. Calderglen Country Park is also within easy reach. Private schooling is available on the Southside of Glasgow at Hutchesons\\\\\\\' Grammar School, Craigholme, Belmont House and also at Hamilton College and Fernhill School. To request a home report - click here.